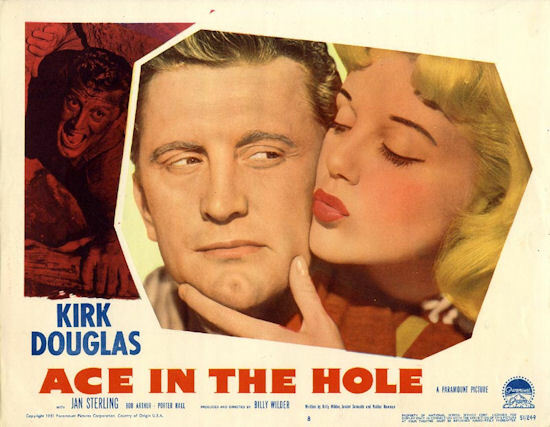 Kirk Douglas and Jan Sterling star in Ace in the Hole (1951). For the first film in my “Ripped From the Headlines”’ series, I’m taking a look at Ace in the Hole, a 1951 Paramount Pictures feature. The film stars Kirk Douglas as Chuck Tatum, an unprincipled former big-city reporter who’s been fired from 11 publications and is endlessly frustrated with his current position on a paper in Albuquerque, New Mexico. Desperate to find a story that will catapult him back to the big time in New York, Tatum finds it when he learns of a man, trading post owner Leo Mimosa, who’s trapped in a nearby cave. He manipulates the relatively simple rescue into a lengthy ordeal that thrusts him into nationwide prominence but ends in tragedy for the focus of the story and, ultimately, Tatum himself. 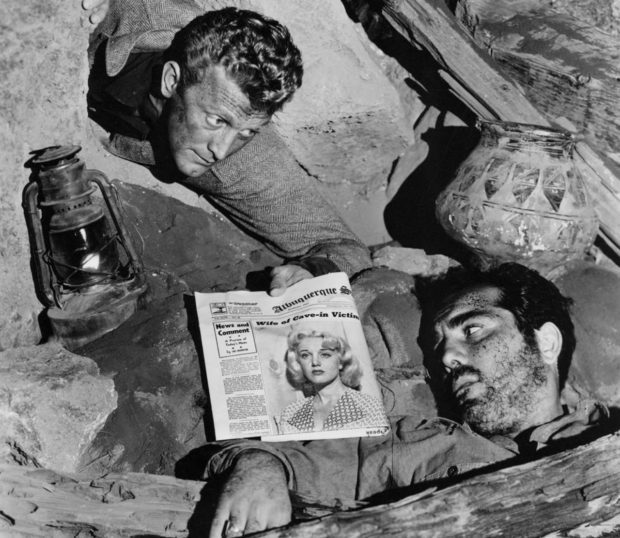 Leo Mimosa (Richard Benedict) lays trapped while Chuck Tatum (Kirk Douglas) shows him the newspaper report on his dire situation. Directed with great skill by Billy Wilder, Ace in the Hole also stars Jan Sterling as the trapped man’s self-centered wife, Ray Teal as the corrupt sheriff who aids the reporter’s efforts, and Richard Benedict as the hapless victim of Tatum’s machinations. It was a flop when it was first released – the unrelentingly grim tale was a turnoff to most critics and moviegoers alike, and changing the name to The Big Carnival when it was re-released didn’t help much. Ace in the Hole was based on the life of Floyd Collins, a cave explorer in central Kentucky, who’d discovered a cave in 1917 – Crystal Cave – that was operated as a tourist attraction by his family. The cave’s proximity to the more popular Mammoth Cave, however, meant that the Collins attraction wasn’t much of a moneymaker. In late January 1925, seeking to increase the family coffers, Collins determined to explore the little-known Sand Cave and made a deal with the cave’s owner to split the profits if it proved to be a success. Striking out on his own, and armed only with a single kerosene lamp, Collins entered Sand Cave, frequently having to squeeze through tight passageways and even crawl on his stomach to make his way. At one point, he became pinned by a 27-pound rock, either by accidentally knocking over his lamp or by dislodging the rock with his foot. Regardless of how it happened, Collins was trapped. Meanwhile, a carnival-type atmosphere had sprung up outside the cave, with masses of vendors setting up shop to sell foods and beverages, balloons, and a variety of tonics and elixirs. A progression of ministers arrived to pray for Collins’s soul, and gawkers numbered in the tens of thousands, parking for miles around in every direction. A variety of theories had emerged on the best way to carry out the rescue, from Vaseline to an oxyacetylene torch to burn away the rock. For the first four days, rescuers were able to get food and water to Collins, but two cave-ins completely cut off the entrance passageway, and it was determined that the only way to reach Collins was through a shaft sunk straight down in the earth. This slow and painstaking process took nearly two weeks, and by the time the rescuers reached Collins, he had died from lack of food and water, compounded by hypothermia. 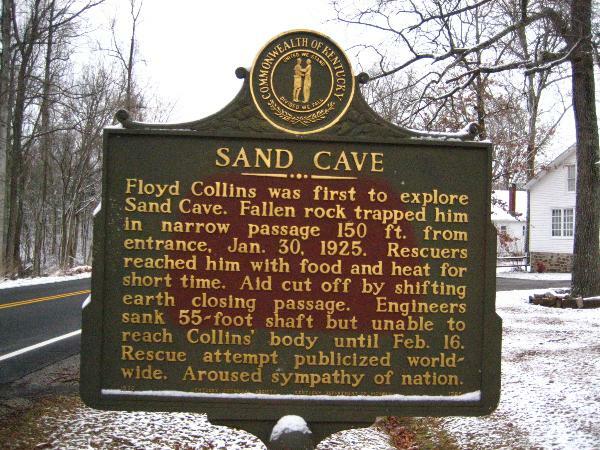 The historic Sand Cave sign remembering explorer Floyd Collins’ accidental death on January 30, 1925. After the 1951 release of the movie, director Billy Wilder – who co-wrote the screenplay and also served as producer – was sued for plagiarism by one Victor Desny. An actor and budding screenwriter, Desny claimed that he’d contacted Wilder’s secretary to pitch the idea of a film based on Collins. Wilder’s lawyer argued that the Collins story was not governed by copyright laws and that Desny’s phone call was not a formal story submission. A judge ruled in Wilder’s favor in 1953, but three years later, the California State Supreme Court overturned the decision and Wilder wound up paying Desny approximately $15,000. 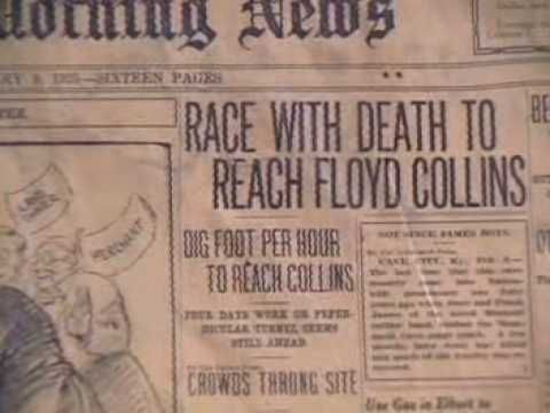 One more tidbit about the film – in it, the Chuck Tatum character mentions both the Collins tragedy and Skeets Miller’s prize-winning reporting, providing a unique marriage of truth and fiction. Stay tuned for my next look at a film noir Ripped from the Headlines! This entry was posted in Noir Nook, Posts by Karen Burroughs Hannsberry, Uncategorized and tagged Ace in the hole, film noir, Floyd Collins, jan sterling, Kirk Douglas, Noir Nook, Richard Benedict, Ripped from the Headlines. Bookmark the permalink. Fascinating as history and tragedy. Fascinating also as a tale of ambition gone wrong. Slowly, but surely I am learning to call this movie Ace in the Hole having first seen it as The Big Circus, which I thought fit perfectly. The Big Carnival, yes? The Big Circus came out in 1959 with a second tier, but all star cast, headed by Victor Mature. And, not at all bad. Thanks, Paddy! I first saw it as The Big Carnival, too. Both names are certainly fitting, that’s for sure. Both ACE IN THE HOLE and THE BIG CARNIVAL titles are fitting, given the subject matter of the film. It’s about ambition being corrupted by fame. You’re so right, David — they both perfectly encapsulate the spirit of the film. What I mean is, that fame on it s own terms is not a corrupting force. The corruption is there, at home, your neighborhood or town, even if one labors in anonymity. The individual is responsible for himself, not a greater society. I’ve seen this film twice and it has horrified me both times, because it triggers my tendency to claustrophobia and, even more, pushes my face into the easy cruelty of he exploitation of others’ pain for one’s own profit.. I know what you mean, Gloria — both with the horrifying idea of being trapped in the cave, and the awful — yet so believable — response of the public.